↑ Windling, Terri. "Beauty and the Beast, Old and New ওয়েব্যাক মেশিনে আর্কাইভকৃত ২৬ জুলাই ২০১৪ তারিখে". The Journal of Mythic Arts. The Endicott Studio. ↑ Stouff, Jean. "La Belle et la Bête". Biblioweb. ↑ Harrison, "Cupid and Psyche", Oxford Encyclopedia of Ancient Greece and Rome',' p. 339. ↑ BBC (20 January 2016). 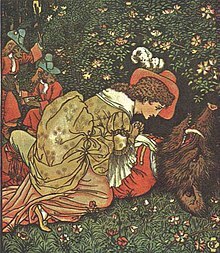 "Fairy tale origins thousands of years old, researchers say". বিবিসি নিউজ. ↑ Wherry, Maryan (2015). "More than a Love Story: The Complexities of the Popular Romance". In Berberich, Christine. The Bloomsbury Introduction to Popular Fiction. Bloomsbury. p. 55. আইএসবিএন ৯৭৮-১৪৪১১৭২০১৩.